Want to make christmas stockings? Designer Patricia Hooning (Fishuals) explains to you how. Order the fabric with the pattern at Motiflow, it's super easy and most of all: super fun! The christmas stockings were introduced by America. You also see them often in christmas films. Pay attention to it when you watch Home Alone 2 again this year! 😉 It looks cozy, lifts up the fire place and get you that instant christmas feeling. "I love Christmas. For this cozy december time I made several ready-to-use patterns for christmas stockings! My personal favourite is the one with the fawns in the woods. The illustration has that 'vintage feeling' because of the style and the colors I've chosen. The stockings will be a good match between all that trendy vintage stuff you see in the shops nowadays," says Patricia. Choose - Go to Fishuals' Motiflow-shop and find your favourite christmas stocking! With lights, fawns or even candy canes..
Order - Found the one? For 1 christmas stocking you need to order 50x100 cm. If you want to make two christmas stockings (one pair) you can order 100x100cm. Cotton Satin is the best fabric for this DIY. Our delivery time is 4-5 working days. Wait for it! - And now the hardes part.. waiting (patiently) for the delivery man! Sew it - The sewing-instructions are printed on the fabric as well (in Dutch). In case your not, we also explain the steps shortly in this blog. Order your christmas stocking pattern here! Fabric for the inside/lining of the stocking. You can use a piece of left-over fabric. If you can, choose a thicker fabric so the stocking will get more strength. And if you want to, a ornamental band to spice it up a bit. TIP from Patricia: "If you don't have sewing machine, you should really check the thrift store. I bought mine there as well." Take the fabric you use for the lining of the fabric. Lay the Motiflow fabric with the stocking pattern upon the lining. Than cut out the socks of the pattern, so after that you'll have four stockings. Put the stockings with the christmas print on each other (so with the printed sides towards each other) and pin it. Thereafter, you stitch the fabric to each other along the white line. Leave the upside open and turn the stocking inside out. You can use a pencil to push the fabric in the corners. Put the 'lining stockings' on top of each other as wel, pin them and then stitch along the edges. Leave the upside open but don't turn the stocking inside out. Double up the band (the rectangle) with the short sides towards each other and the good side upwards. Stitch it and make a zoom at one side. Make sure you pay attention to the direction of the pattern! You can finish it by sewing a ornamental band on the bottom. Put the lining in the Motiflow-stocking and pin the top sides to each other. Also pin the band to the inside of the stocking as well (around). Make sure the 'good side' (so the printed side) faces the lining. Pin the hanging strap between the band and the lining. Sew the parts together. Turn around the band to the outside and stitch it all around, or only on the sides. "Hang it above the fireplace, sing a christmas song and put something special in it for a beloved one! Or give the stocking as a present (wrapped in some nice wrapping paper by Fishuals). Anyway, happy holidays and much do-it-yourself fun with my christmas stockings at Motiflow! Will you share a photo on social media if you are going to make a stocking? A festive greeting on my behalf!" Steal the show at christmas diner! The pattern with the fawns is perfect for a christmas stocking, but you could also make a skirt (choose our Cotton Jersey fabric!). Your daughter will steal the show at christmas dinner. Also after that the skirt can still be worn. How lovely! 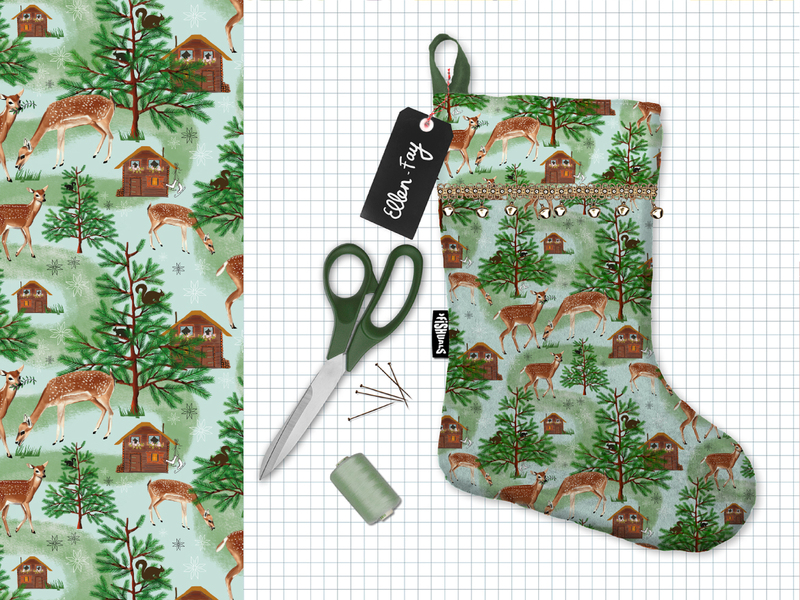 The fawns and christmas branches pattenrs by Patricia Hooning are also available as fabric at Motiflow. And of course there are many more fun christmas patterns! Are you going to make this christmas stocking? Share a photo of the end result with #diymotiflow, so we can like, share and check out your creations. Also don't forget to tag @fishuals!